We are offering our valued clients an impeccable range of Continuous Rotary Dryer. This range is manufactured using supreme-grade basic material and latest machinery. We precisely design this offered range in accordance with the defined parameters of the industry and clients' requirements. Furthermore, we are able to provide these products in diverse specifications according to the requirements of our valued clients. InThe Continuous Rotary Dryer is used for Dry the different material. be fitted with the Chimney for removing of Hot Air during Cooling. each Roller) are also fitted in the Roller Shaft on which the Drier Shell rotates. Rings and there is adjusting arrangement on the base frame of the Thruster base. fixed with the Gear Box, Driving Shaft which rotates through Chain, Sprocket and Motor. Rotary Drier Drive. 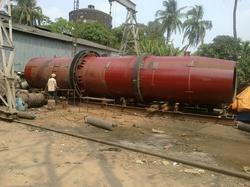 Looking for Continuous Rotary Dryer ?